We're open from Monday to Friday 9:00–17:00. The clinic has disabled access. Disabled drivers using our facility may park in the pay and display bays or resident parking bays in the immediate area free of charge as long as a valid blue badge and clock is displayed. There are several car parks within walking distance of the clinic, namely Regent Street car park, Mayflower House Court, Mayflower Street East and Mayflower Street West. A full list of car parks and their locations can be found on the Plymouth City Council website. The clinic is also accessible via numerous public transport routes, please refer to the Plymouth City Council website for details. Myopia (short-sight) is the clinical term for when distance vision is blurred and near vision is clear. The vision is blurry because light rays come into focus in front of the retina. This usually happens because the myopic eye grows too long. Myopia is often considered as a mere inconvenience, given that spectacle or contact lenses are needed to see clearly. However, myopia also puts the eye at a higher risk of developing serious sight-threatening conditions such as retinal detachments and glaucoma. Globally, the number of people with myopia has increased significantly over the last decade. In the UK, this number has doubled since the 1960s, whilst in South-East Asia 80 per cent of children are myopic. Why do some people become myopic? It is still unclear why some people become myopic but research suggests that it occurs due to a combination of environmental and genetic factors. How can we control myopia? For years there was little we could do to slow down myopia progression. More recently, promising results from several clinical trials suggest that wearing special contact lenses slows down myopia progression. Normal spectacles and contact lenses provide clear vision by focusing light on the fovea (part of the retina where we see the best). This results in clear central vision but the images in the periphery are focused behind the retina. We now know that these peripheral images behind the retina simulate the eye to grow longer in an attempt to reduce the focusing error. But instead of achieving improved focus the eye inevitably becomes longer and the myopia progresses. To stop this mechanism, specialist contact lenses have been developed to bring the peripheral images in front of the retina thus removing the stimulus for excessive eye growth. Myopia usually starts around the age of seven and progresses most rapidly during the school years into early adulthood. Therefore, myopia control intervention is most effective during this period of time. Can we stop or reverse myopia? No. Although we may be able to slow down the progression of myopia we cannot stop it altogether as the eye will continue to grow but just at a slower rate than it would without the myopia control treatment. There is no proven treatment to reverse myopia. What can the myopia control clinic offer? The clinic offers evidence-based optical treatments to slow down myopia in children and young adults. As part of the consultation we will assess your eyes with advanced imaging instruments to assess the length, curvature and power of the eye. We will also ask you about your family history and lifestyle as some of these factors may affect how quickly your myopia progresses. If we find that you are a suitable candidate for myopia control then we will discuss the various options available and book you in for a myopia control contact lens fitting appointment. If we are able to successfully fit you with the contact lenses we will need to monitor your eyes regularly. There is more than one method for achieving myopia control and it is too early to say which of these methods is the most effective. As part of the consultation we will discuss all options with you and your child. Daily disposable contact lenses (Coopervision MiSight) – if these contact lenses are fitted then the fitting cost is £50 (which includes any follow up appointments during the fitting phase). The direct debit cost for the lenses and all aftercare and myopia control follow-ups is £40 per month. Orthokeratology (ortho-K) lenses – if ortho-K lenses are fitted then the fitting cost will be £150 (which includes solutions and three follow up appointments during the fitting phase). The direct debit cost for the lenses and all aftercare and myopia control follow-ups is £40 per month. What to bring to the first appointment? 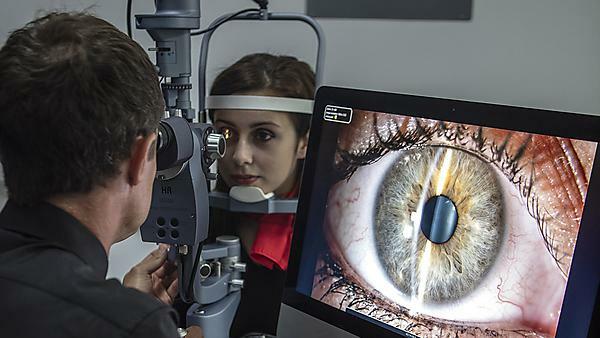 If you have not been to our University of Plymouth Centre for Eyecare Excellence clinic before it would be useful to bring the prescription from the last three years; your optometrist should be able to provide this. Please also bring your current spectacles with you. If you wear contact lenses please bring these with you and the boxes/blister packs with details of the lenses. How to make an appointment to see us? If you or your child are myopic and you are interested in myopia control you can make a self-referral to our clinics. If you are a practitioner, you can refer your patients to us; please content the CEE team for further information. Researchers at the University of Plymouth are involved in myopia control research and are part of the Myopia Consortium UK. During your eye exam our staff and students may invite you to participate in any ongoing clinical studies we may be running but there is no obligation to participate.